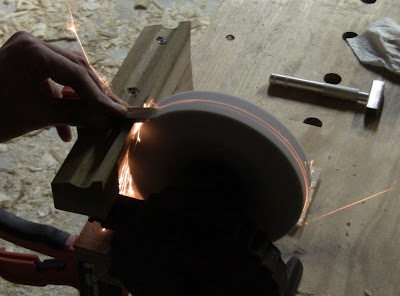 Even a hand-cranked grinder makes sparks fly! 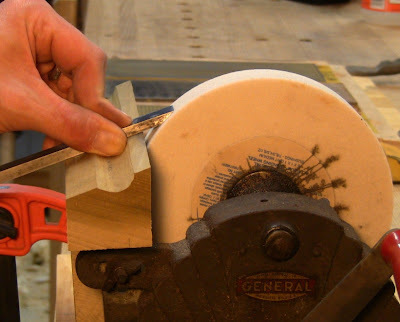 In my post and video Single-Bevel DuoSharp Sharpening, I was trying to reproduce the method used by Mark Rhodes, a professional woodworker in the UK. However, I got it wrong. I thought he uses nothing but a single bevel, but he actually hollow-grinds first. So while I was able to get useful results purely with a single-bevel, this corrects that. 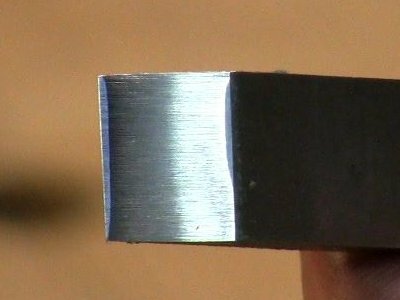 The main complaint about strict single-bevel is that, except for Japanese tools which have a softer steel back welded to a hard steel for the edge, it's more time-consuming. In fact, that's why the double-bevel method came about hundreds of years ago. The primary bevel was ground on a grindstone, and the secondary bevel was honed by hand. Hollow grinding is similar to double-bevel, but has an additional advantage. The grinder removes the bulk of the metal to save time during the honing steps. Then when honing, the two ends of the hollow curve surface form registration points for accurately maintaining the honing angle. This can produce a flat bevel at the edge comparable to the flat bevel produced with a honing guide. The initial contact points become flats that continue to provide registration over multiple honings before it becomes necessary to re-establish the hollow. 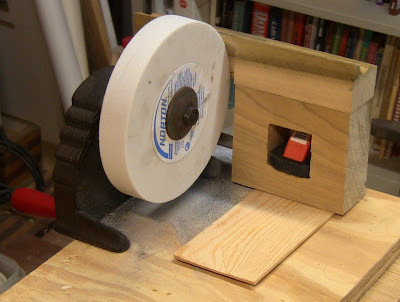 I first saw this method several years ago on an episode of David Marks' TV show Wood Works. He used a hand-crank grinder, followed by honing on waterstones. 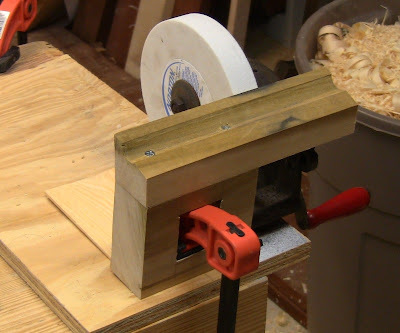 He had a wooden tool rest that made it easy to maintain the grinding angle. 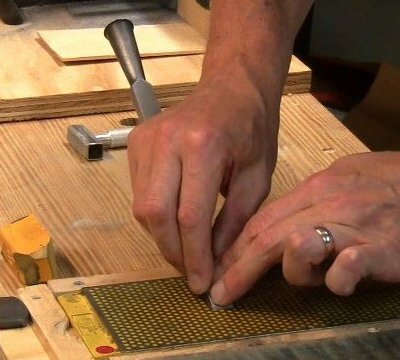 When I went looking for the Wood Works episode, I couldn't find it, but I did find a reference to Marks using a tool rest from James Krenov's book The Fine Art of Cabinetmaking . Aha! I knew Marks studied under Krenov, and there it was on page 109 of my copy. I made one with a short surface as he shows for chisels. The only difference was that I mortised out a hole for the clamp, where he just saws a block into a U-shape. Shims under the front edge of the base adjust its angle. It's a little fidgety to adjust and clamp down, and you're setting everything up largely by eye, but it's simple and effective. 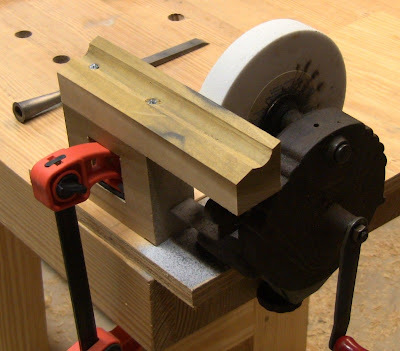 The shim under the front edge adjusts the angle of the tool rest. It's held in place by the clamp. I made the trough with a round molding plane, though you can also plow out a square trough. How to hold the tool on the tool rest. Adjust the shim to produce the desidered grinding angle. It only took me a few minutes to grind the hollow in the face of the chisel. I used a light touch, and checked it frequently. You may also need to cool it by dipping in water, even with a hand-cranked grinder. Ideally, you only need to grind to within a millimeter of the edge. The reference flats will hone down easily from that. Similar to the two bevels of a double-bevel chasing each other up and down the face over time, the hollow and the flats will chase each other back and forth over time. Regrind when the two flats are close to joining up into a single flat. My grinding skills still need practice. I overground one end right out to the edge, so I ground the rest out to make it consistent. 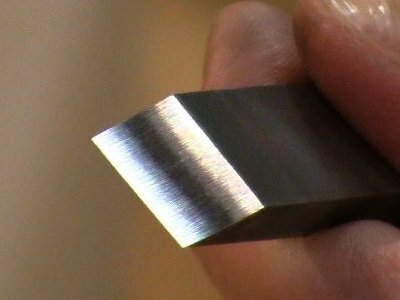 The key to honing with this method is to rock the edge up and down on the sharpening stone until it "clicks" into place, with the two ends of the hollow grind making even contact. Then hold it in this position while moving the tool sideway up and down the stone. Mark Rhodes only uses a DMT Red, and sometimes uses a finer stone, then strops. So I used just the Red side of my DuoSharp, followed by a strop. It doesn't take much to hone a flat and produce a burr. I stopped as soon as I had consistent burr along the edge. No need to remove any more metal. 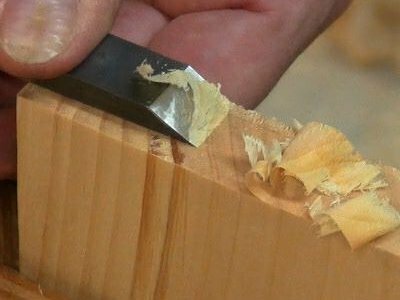 That produced a very narrow flat; you may want to have a wider flat, especially if you'll be doing heavy work with the chisel. All it takes is a few mores strokes on the stone. When stropping, now that I had a dead-flat bevel across the flats, I used a lighter pressure on the face, since I didn't want the flex of the leather surface to round over the edge. People argue over whether that's really a concern or not. I fall on the side of believing it is. When I strop using convex bevel methods, I rely on that flex to make the leather conform to the convexity. I did about 10 strokes on the face, 10 on the back, then alternately one on each side, twice. Finding the registration point where the two ends of the hollow contact the stone. Then keep pressure on the end while moving up and down the stone. The finished edge with a narrow flat that will grow over repeated resharpenings, until it's time to regrind the hollow. The inconsistent flat on the right shows that my grinding still needs work. But it's sufficient to get a sharp edge. 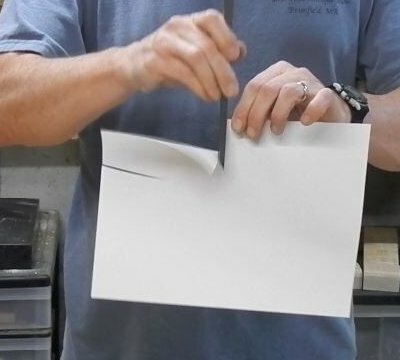 The edge easily passes the paper-cutting test, both along the length, and across it, which is harder because it's across the grain of the paper. It also takes beautiful fine shavings in white pine end grain. As with all the other methods I've practiced, I was able to get excellent results. The key lessons to be learned are that there are many ways to sharpen that work well (though people will endlessly debate multiple aspects of each), but that they all take an investment in time and practice. Some may offer quicker success, but it's not that difficult to get them all on par. I also think that success with one improves your results with others, since you're constantly improving and gaining better overall control. So it's worth circling back and trying some of your earlier methods again. This completes my obsession with sharpening methods. Thank you, sir! Great article - you explain everything in detail just the way it's supposed to be! True - everything has its pros and cons - it's all about which method suits you best. I'm curious to know how you go about your sharpening now its a year on? Well that's worth a blog post itself! So I did: http://www.closegrain.com/2013/08/how-do-you-go-about-your-sharpening-now.html.